Marie Maglaque Blog: Coming soon :: A Garden Party for my Grand-Ma! Coming soon :: A Garden Party for my Grand-Ma! Today we held a garden party for my Grand-Ma who is turning 95 tomorrow. We weren't very sure to throw her a party as she recently had a serious injury, so I worked out a simple and colorful decoration theme. I will very soon share a lot more pictures about the party, stay tuned! I shopped the paper garland in Amsterdam and I had made the bunting banner for my last styling for Beautiful Revelry (check it all out here). 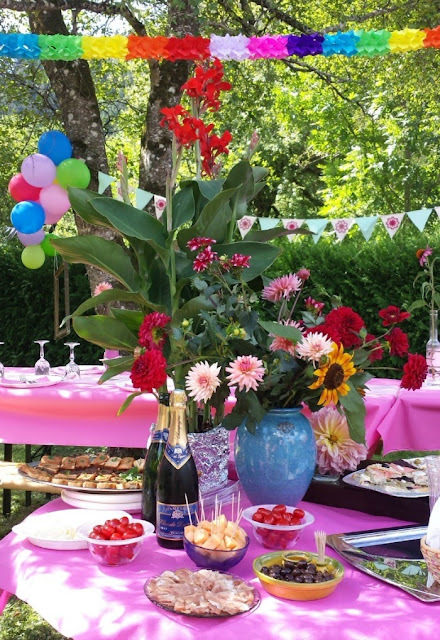 Add some balloons - which always keep the kids entertained, colorful table clothes and plenty of flowers and you are done! That is the suitable weblog for anyone who wants to seek out out about this topic. You realize so much its nearly onerous to argue with you (not that I actually would need…HaHa). You positively put a brand new spin on a subject thats been written about for years. Nice stuff, just nice! Elle a du être très heureuse te grand-mère de cette petite fête! Thank you for your comment @hall in los angeles! @Laetitia: oui elle etait super heureuse! j'ai plein d'autres photos a partager, mais pas de temps ces jours-ci. Le jet lag nous tient! !